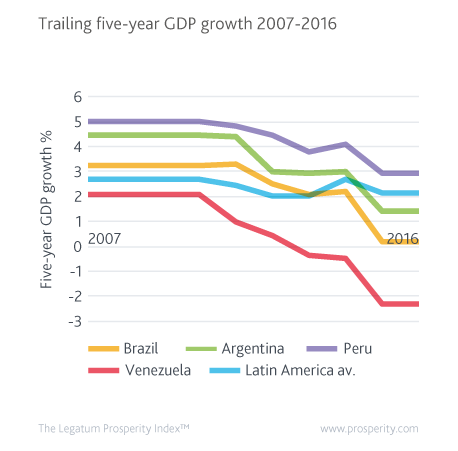 Latin America: A decade of prosperity gains about to disappear? With literacy rates higher than 90 percent, improved democracy levels, large reductions in absolute poverty, and efforts to reduce inequality through ambitious social programmes, Latin America has undergone a deep social and economic transformation over the last ten years. Particular achievements can be observed in the region’s best-performing sub-indices since 2007: Health and Personal Freedom. The fear is that a decade of prosperity gains will be lost now that the windfall from the commodities boom has subsided and demand from China is disappearing. Latin America finds itself at a turning point again. Can the regional leaders finally overcome the long history of boom-and-bust cycles? 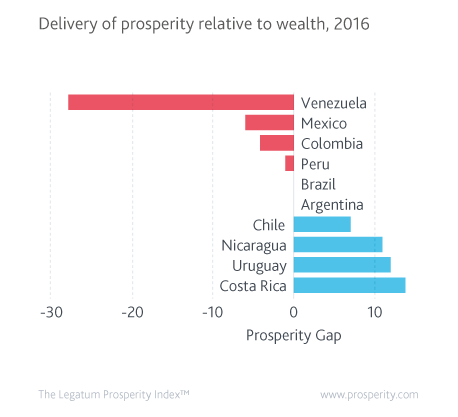 Interestingly, the prosperity surplus in Latin America - the amount of prosperity delivered relative to wealth levels - has been small but relatively stable. Not surprisingly, Costa Rica, Uruguay, Nicaragua, and Chile enjoy the highest prosperity surpluses, while Colombia, Mexico, Peru, and Venezuela are among seven of 23 Latin American countries covered by the Prosperity Index that are still struggling with a prosperity deficit. Argentina is this decade’s rising star, with the largest increase in delivery of prosperity compared to wealth in the region, thanks in particular to a 42-rank improvement in its Education sub-index. This is highly encouraging for a nation whose past has been marred by severe economic crises. Venezuela keeps the unenviable title of Latin America’s biggest disappointment, with one of the world’s largest prosperity deficits. Its current oil crisis is a symbol of Dutch disease gone badly wrong and there is currently little hope for increased prosperity. Not only has its Economic Quality sub-index collapsed by 36 ranks but standards of living have plummeted by 56 percent, and with a 57-rank decline Social Capital is at an all-time low. Gains made in the past decade have pretty much evaporated. 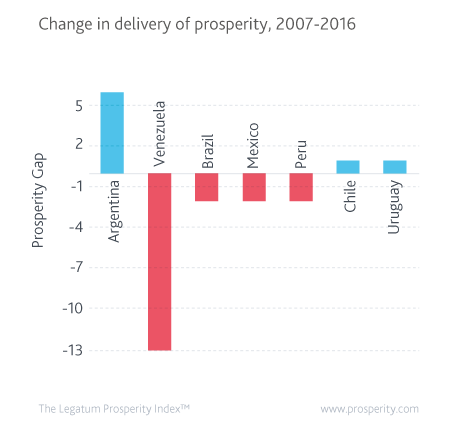 Despite the few bright spots, Latin America overall is delivering far less prosperity to its citizens than its peers in developing Asia. GDP growth has almost completely collapsed since 2010, and this has been followed by deterioration in the region’s average Health, Environment, and Governance ranks. Why is Latin America particularly prone to an erosion of prosperity when growth slows? 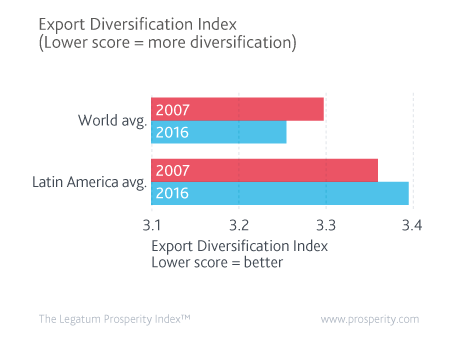 Latin American growth is built on a weak foundation—primary commodity exports. A boom in the demand for primary commodities temporarily drives growth, but it does so without establishing the structural foundations needed for longer-term development. When the bust comes, Latin American countries find themselves without demand for their exports and - more problematically - without the Business Environment, Education, and Economic Quality needed to provide an alternative source of success. Prosperity evaporates. In order to achieve greater resilience, more investment in the workforce is essential. Despite overall improvements in the Education sub-index, secondary education per worker is only 2.7 years; this contrasts with Sri Lanka and Mauritius, where it is more than 3.7 years, and Kazakhstan, which reaches as high as 6.6 years. Tertiary education is still too underdeveloped. Declining Safety & Security scores are caused by extremely high levels of internal violence, mainly driven by organized crime, drug-trafficking, and gangs; these are undermining human development and the growth of prosperity. A new model for Brazil? For years, Brazil relied on the commodities boom to reduce poverty and, indeed, to transform it into one of the world’s greatest economies. It is now facing the dire consequences of that complacency, but - fortunately - it still has the greatest potential for diversification of any Latin American country. Since the impeachment and removal from office of President Dilma Rousseff in 2016, the question has become: what new model should replace doctrinaire socialism in order to rescue the Brazilian economy, whose GDP has fallen for six successive quarters? Brazil is indicative of a wider trend. Since the commodities boom ended, left-leaning governments in the region have lost credibility with their populations and been ousted in Brazil, Argentina, and Peru; the hard-left government of Venezuela faces considerable opposition in the streets as the country’s economy collapses. 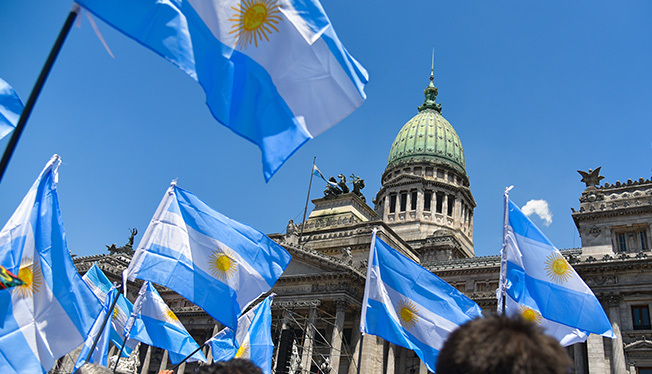 The results of these political developments are still unclear, but if Latin America wants to make strides forwards, it will have to drastically improve its worst-performing sub-index: Governance. Is Latin America at a turning point? It is a continent full of untapped potential, facing increased expectations from a rising middle class that demands more than poverty alleviation. 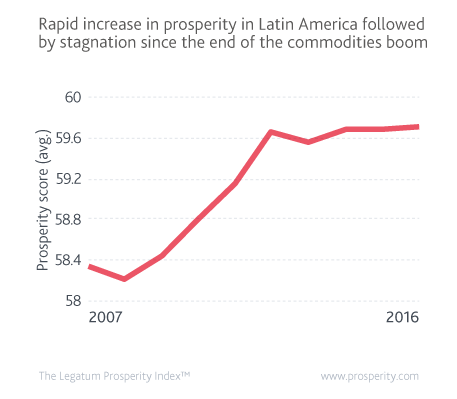 With a significant reversal in the groundwork that has been achieved and a middle class confronting the ruins of a once buoyant economy, Latin America needs to take far firmer measures to hold onto its gains in prosperity. It is one thing to obtain prosperity and another to keep it.